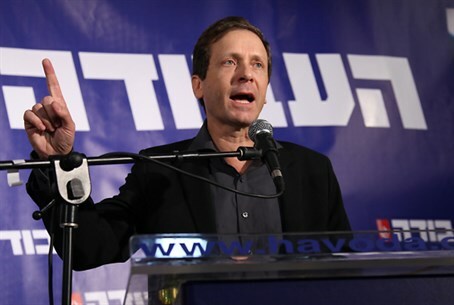 Political analysts say that MK Yitzchak Herzog could be easier to convince to join the coalition than MK Shelly Yechimovich. Political analysts say that the Labor party’s new leader, MK Yitzchak Herzog, could be easier to convince to join the coalition than outgoing leader MK Shelly Yechimovich. Herzog on Friday was declared the winner of the Labor primaries, beating Yechimovich by a 16% margin. According to Channel 10 News’ political analysts Raviv Drooker and Nadav Perry, Prime Minister Binyamin Netanyahu and his associates see Herzog as a future coalition partner and as a threat to the Jewish Home (Bayit Yehudi) party headed by Minister Naftali Bennett. Drooker and Perry noted that Labor MK Erel Margalit, one of Herzog’s supporters, recently met one on one with Netanyahu. Furthermore, they noted, as Thursday’s primaries concluded, Deputy Foreign Minister Ze’ev Elkin who accompanied Netanyahu on his trip to Russia was corresponding on the plane with another of Herzog’s supporters, MK Eitan Cabel. Yechimovich was always vocal about the fact that she would not join Netanyahu’s coalition at any cost, explaining that his views and her views on social issues were too different. She did, however, indicate that she would not rule out joining the coalition if a peace agreement with the Palestinian Authority is reached. Herzog, on the other hand, has never publicly stated that he would not join Netanyahu’s coalition if he is elected Labor leader. On Thursday, however, he emphasized in a radio interview that any reports that he supports joining the coalition are a "spin" and that he only wishes to replace the current government - not join it. Justice Minister Tzipi Livni (Hatnua), eager to see a coalition that would it make it easier for her to pass an agreement with the PA, has been calling Labor to join the coalition in order to weaken the Jewish Home. While this was nearly impossible with Yechimovich at the helm of the Labor party, analysts believe this might be easier with Herzog. Yechimovich, said Drooker and Perry, chose to keep a low profile on Friday and only issued a short statement about her loss. She is likely to continue to stay behind the scenes in the near future, they predicted, and will wait to see whether Herzog joins the coalition before trying to re-establish her standing within the Labor party. Yechimovich’s loss, according to the analysts, was largely due to the “sin of arrogance”. She chose to rely on a poll that predicted that she would win the primaries by a 20% margin and thus chose not to seriously campaign. As well, they said, Yechimovich alienated a large chunk of the Labor party members from the Arab sector. During a meeting with Arab members of the party attended by both candidates, Herzog made promises in order to try to win votes, while Yechimovich ascended to the podium and declared that, as far as she was concerned, all those present can choose not to vote for her since she will win in any case.